Well, a) it *didn’t* get cleaned up, b) having power armor fly through its roof probably wasn’t very good for it, and c) having people rush through it and confiscate half the items probably messed it up further. So take your pick. There’s a fair chance she’s bluffing to figure out how much Nick knows and how lazy he was being. I mean, you’d normally think that if one is cleaning the warehouse, they’d know what transpires inside it. 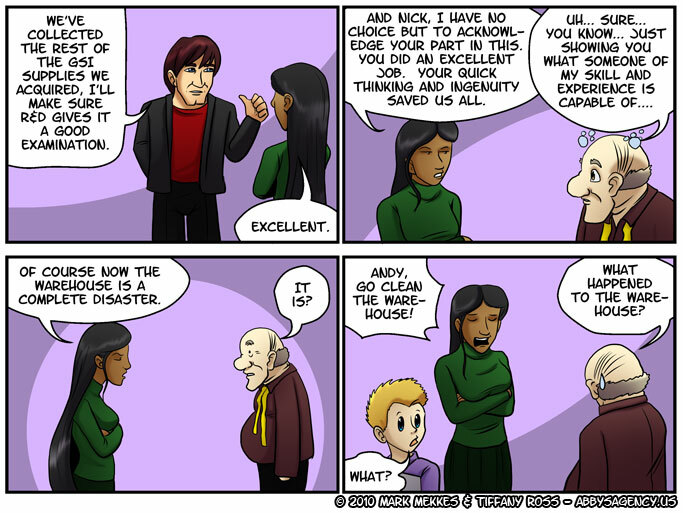 Nick’s speech bubble in the last panel indicates something different.